While you may be aware of the pain spyware inflicts on both your mind as well as your wallet, spyware and adware remain the one area where antivirus / internet security programs fall short. For anyone looking to strengthen their defenses and add an extra layer of protection against various threats, SUPERAntiSpyware is a nice choice. It features many unique and powerful technologies and removes spyware threats that other applications fail to remove. SUPERAntiSpyware currently protects over 40 million users worldwide from harmful spyware infections, and has a 5-star (Spectacular) rating from CNET. 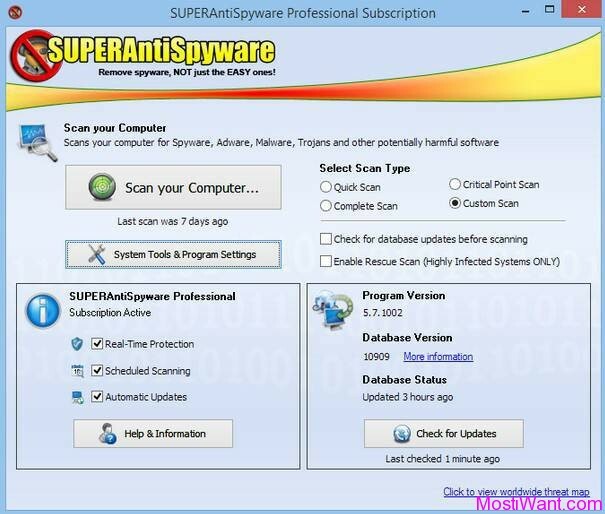 SUPERAntiSpyware is available as a free and professional edition. Both editions are light on System resources, and support the detection and removal of all sorts of malicious programs including the toughest of spyware infections as well as “rogue” spyware infections and well over 1,500,000 other harmful application components. Users can add trust items and folders to a whitelist for complete customization of scanning. SUPERAntiSpyware Free Edition lacks real-time protection, First Chance Prevention, Registry Protection, Auto-Scanning, scheduled scans and automatic updates (manual only), as well as several other advanced options. SUPERAntiSpyware Professional Edition adds critically important real-time protection to ensure protection from installation or re-installation of potential threats as you surf the Internet. Used in conjunction with First Chance Prevention and Registry Protection, your computer is protected from thousands of threats that attempt to infect and infiltrate your system at startup or while shutting down your system. The Scheduling, Automatic Updates and Daily Definition Updates featured in SUPERAntiSpyware Professional provide the additional elements for protection that guarantees your system is protected with the most up-to-date protective information available. Plus, Users of SUPERAntiSpyware Professional also enjoy exemplary customer support and free system diagnostic services. Advanced detection and removal of Spyware, Adware, Malware, Trojans, Dialers, Worms, Keyloggers, HiJackers, Parasites, Rootkits, rogue security products and many other types of threats. Now, in cooperation with superantispyware.com, we can offer 20 free license keys to activate the Full Version of SUPERAntiSpyware Professional Edition for one full year. To participate in the Giveaway, simply leave a comment below to let us known that you need it. A valid email address must be entered on the “Mail” field (used to deliver license info only). And do NOT post email address inside comments to avoid spam. If you wish to share this post, to help spread the word among your friends, you may use the sharing widget placed at the end of this post. Sharing is NOT mandatory for eligibility, but the more you share, the more your chances (remember to place its status URL in the comment so that I can verify that you’ve done that)! If you do not use any social site, you may write a short review or tell us why you need this software in the comment. The giveaway contest will end on December 20, 2013, 12:00 PM GMT. 10 winners will be chosen by me and the balance 10 will be selected randomly according to random.org, and winners will be announced (in this post) as soon as possible. At last, thanks Seth from superantispyware.com and on behalf of all my readers for this great gift! Updated: Giveaway closed now. Winners will be announced as soon as possible. 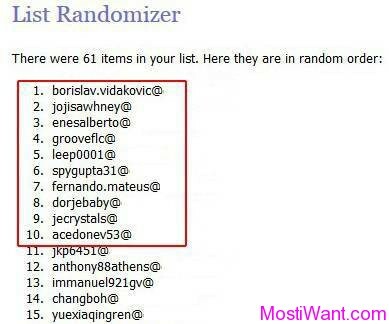 And I have already sent the licenses to the winners! Wish you all a happy holiday season and a happy New Year! Dear Spy, I have resent the code to you. Please check for it again. If the e-mail hasn’t arrived within 15 minutes, please check your spam, promotions or social mail folder to locate it. I need a license super anti spyware pro. I hope to win. Thanks for the chance. SAS (Free Edition) has always been on my computer. I would absolutely love to win a license for a Pro Edition! SUPERAntiSpyware is an excellent antispyware software, so I need it for my PC. Really need this software, SuperAntiSpyware Pro. Thanks for the free giveaway. thnx a lot sir, your website is really awesome and you are doing very kind job in providng us all free giveaways n especially for superantispyware pro version which is a must software for every pc user because nowadays malwares and spywares have became a very big problem resulting is loss of money,data n lots of troubles.but we are fortunate enough to have superantispyware within our reach thus getting safe from all of them. so at last thanks a lot “mostiwant.com” i am a huge fan of yours . . .
Great giveaway. Thanks and count me in! Ще бъда щастлив да опитам PRO – версията на тази отлична програма! Поздрави! Thanks you so much for this giveaway.